A tail section of a OFAB-250 bomb planted in the alleged SARC warehouse in an effort to blame Russia and Syria for the alleged airstrike. 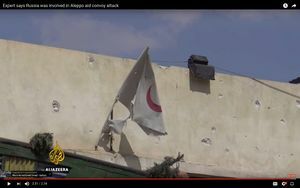 Was the Red Crescent flag in this spot at the time of the attack or was it placed there after the attack? Note the flimsy attachement. 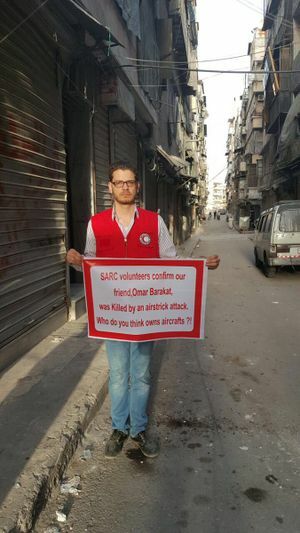 An activist in east Aleppo dressed in a SARC outfit protesting against the killing of Omar Barakat in a "regime airstrike"
A Syrian Red Crescent aid convoy was attacked at a warehouse in Urm al-Kubra (أورم الكبرى - Big Orem‎‎, also transliterated Urum, Uram / Urem al-Kubra etc.) west of Aleppo on September 19, 2016. At least 18 out of 31 trucks were said to be destroyed with some 10-12 people reported killed - a number later raised to about 20, and then 31. The attack is said to have happened around 7:10-7:30 pm, right after the 7 day ceasefire ended at 7 pm and the Syrian and Russian air forces restarted airstrikes. The United States and allies have placed the blame on a Russian or Syrian airstrike, and insisted Russia be held responsible either way. Russian and Syrian authorities have offered some alternative explanations that the convoy was attacked by armed groups on the ground, and/or by a 'predator' drone overhead at the time. The convoy came from government controlled west Aleppo with government clearance and opposition acceptance. The convoy was monitored by a Russian reconnaissance drone with real time streaming on YouTube. It sat parked in Islamist-rebel-administered areas for about six hours or more before the attack. It's unknown whether any terrorist surveillance became aware of their presence. The attack happened two days after the US airstrike on Syrian Arab Army in Deir ez-Zor, and just as the United States and Russia were set to coordinate their air offensives against Islamic State, as well now as against Jabhat al-Nusra, which will clearly be complicated now, at best. 5 How Russia did it! A total of four regime helicopters targeted it with 8 barrel bombs. Russian aircraft then stuck the location with cluster bombs, preventing the civil defense from reaching the location of the attack, giving first aid to those requiring it and removing the dead bodies. 25 vehicles have been burnt and the fire has not yet been put out. 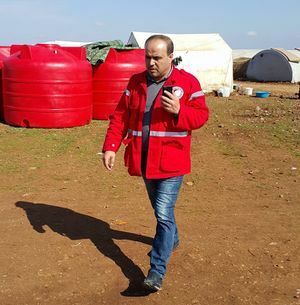 The head of the Syrian Red Crescent, Omar Barakat, was killed along with eight of his staff. More than ten drivers have been burned to death. The video was recorded this evening by a member of the civil defense at the location of the attack. Another activist video, "civil defense ourm 19-9-2016" caption, Published on Sep 20, 2016 label. Time = ? Much of the media and its readers are mixing up the UN convoy that never entered Syria with this SARC convoy that came from west Aleppo. This false information is constantly repeated by Western media, even two weeks after the attack. Two weeks ago, a UN aid convoy was bombed, killing dozens of aid workers attempting to deliver critical supplies to the more than 200,000 Aleppo residents trapped inside the eastern portion of the city, once Syria’s most populated. Aid convoys up in flames in rural west Aleppo. Civil Defence at scene describe what happened FSA Platform - White Hemlet at the scene, night-time, fires burning, speaking in English at the Red Crescent center, he blames helicopters for the first part of the attack, gets cut off before explaining the second attack. Starts with blaming Russia (rusie)(?) 1:36 street washing; 1:46 bobcat/loader. The first three seem to be taken from about the same location. They show the same 2-story building in the foreground. Jake Godin on Twitter: Daylight photos from site where @SYRedCrescent was bombed yesterday in western #Aleppo starting to emerge. 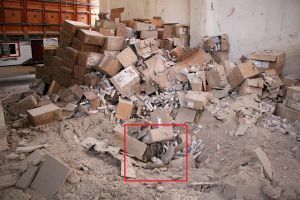 Here are some from @AleppoAMC"
"OFAB 250-270 tail" in the alleged SARC warehouse; 92 kg of high explosives and cardboard boxes surviving nearby? What's next?twitter, 12:12 PM - 20 Sep 2016. Said to be from BBC video. Newer photos however show that unexploded Russian OFAB-250 bomb is nothing more lone tail section evidently planted at the site. The aid convoy was part of a routine dispatch from government-held Aleppo to rural rebel-held parts of the province. There was no immediate comment from the government. The trucks left regime-held areas. Their exit was coordinated with the regime. Russian drones w cameras followed the convoy's movements. The Syrian Observatory for Human Rights, a UK-based monitoring group, said the attacks were carried out by either Syrian or Russian aircraft. It added the dead included the Syrian Arab Red Crescent volunteers and drivers. The UN aid chief Stephen O'Brien said if the "callous attack" was found to be deliberate it would amount to a war crime. In Geneva, spokesman Jens Laerke of OCHA said on Tuesday that further aid delivery would hold pending a review of the security situation in Syria in the aftermath of the airstrikes. Laerke called it "a very, very dark day... for humanitarians across the world." NEW YORK – At least a dozen humanitarian aid workers, and an unknown number of civilians, were killed Monday in an airstrike on a convoy delivering assistance west of Aleppo that the Obama administration said was likely launched by the Syrian government or Russia. President Bashar Assad’s government and its key backers in Moscow, however, finally offered comment on the incident Tuesday, flatly denying any responsibility. 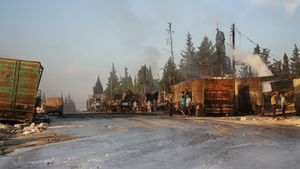 Russia’s Defense Ministry said no Russian or Syrian aircraft had carried out the strikes, and claimed only rebel factions knew the precise whereabouts of the aid convoy. The United Nations rowed back on Tuesday from describing an attack on an aid convoy in Syria as air strikes, saying it did not have conclusive evidence about what had happened. After the Russian explanation, the UN put out a revised version of an earlier statement, removing wording on "air strikes" and replacing it with references to unspecified "attacks." On a clear afternoon last Monday a line of humanitarian aid trucks eased to a stop in front of a cluster of warehouses packed with aid supplies 15 miles outside the Syrian city of Aleppo. 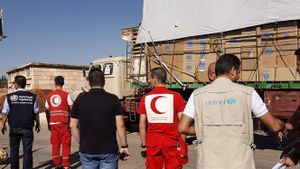 Omar Barakat, director of the local Red Crescent branch, supervised the loading of the 31-vehicle convoy, which was scheduled to drive into the battered city that evening. Hours later, Barakat would be dead, his body one of 20 strewn through the convoy’s burning wreckage after airstrikes hit the idling trucks. "I listened to my colleague from Russia, and I sort of felt a little bit like they're sort of in a parallel universe here," said a visibly angry Kerry, effectively calling Lavrov a liar for blaming the United States for spoiling the ceasefire. Lars Bromley, research adviser at the UN Operational Satellite Applications Programme (Unosat), told a news briefing in Geneva: "With our analysis we determined it was an air strike and I think multiple other sources have said that as well." "For air strikes, what you are usually looking at is the size of the crater that is visible, and the type of crater," he added. "Basically air-dropped munitions are often much larger than anything you would fire from the ground." A former cabinet minister Andrew Mitchell: The UK should explore with its allies how it would enforce a no fly zone, as part of a coalition of the willing. Putin: We know who destroyed aid convoy in Aleppo, Syria - RT, October 12, 2016, and Russia Calling! Investment Forum, kremlin.ru ( ...'it was one of the terrorist organisations' ). “It was one of the terrorist groups. And we know that, say, the Americans know it too, but prefer to take a different position, to falsely accuse Russia. This is not helping,” Putin said at an economic forum in Moscow. An exotic proposal has been made – I am going to surprise you and your audience. It has been proposed that our armed units, Russian military personnel, be deployed on the road to ensure transit safety. The Russian military, who are courageous and decisive people, have said they would do it. But I told them that this could only be done jointly with the US, and ordered them to make the proposal. We have proposed this, and they (the Americans) promptly refused. Inter-agency convoy is crossing the conflict line to Big Orem in Aleppo Syria to deliver aid, liveuamap.com, Twitter, 19 Sept., 2016. 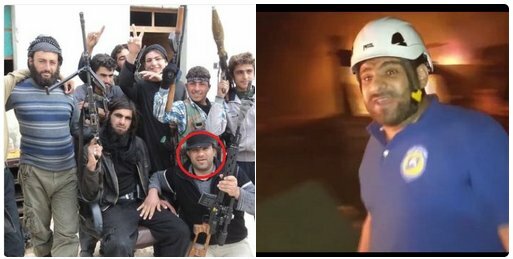 Looks like the White Helmet guy seen on video after the attack is Ammar al-Selmo, head of the Aleppo branch of the White Helmets. But it was in 2011, so it does not count! Q (Sen. Lindsey Graham): Did Russia bomb the UN convoy? A (General Joseph Dunford): Senator, that has not been concluded, but my judgment would be that they did. They are certainly responsible. Press leak about 'two SU 24 planes': evening of Sept. 21, 2016 (UTC), so prior to the above. “I will not speculate about [who perpetrated the attack]. It’s important to get the facts and to find out how this could happened, but I won’t speculate,” Stoltenberg said after a meeting with Lavrov. Churkin at the UN (on video), RT, 25 Sept. 2016. Here in New York, we have learned about that for the first time from the US Secretary of State, who said in a private conversation, that according to 'their' (his/US) information, that two Russian planes for several minutes were somewhere in the area where the humanitarian convoy was, where it was hit. But, he said, do not worry, we will not announce publicly this fact, as we need to figure out what happened (надо разобраться). 'In a few minutes' as usual there were leaks from various news agencies in Washington, and next day, Secretary of State made this tragedy a central part of his dramatic presentation at UNSC ... We have said from the very beginning that it needs to be investigated (надо разобраться) . They first said it was an artillery strike, than helicopters, than planes. I am not a military expert, but I have read somewhere today that the strikes were delivered for 7 hours. But if Russian planes were somewhere in that area for several minutes, could the bombs be falling for several hours? I do not think so. Samantha Power remarks. Quite a lot on White Helmets. Russia and Assad are bombing the humanitarian convoys, hospitals, and first responders who are trying desperately to keep people alive. 'Summary of UN Headquarters ‘Board of Inquiry’ Report', "UN-Syrian Arab Red Crescent aid convoy attacked from the air", -found at dpa-ps.atavist.com (direct link=?). The report itself remains an internal document; it contains footnotes detailing relevant sources and citations, two substantial appendices and hundreds of annexes of relevant evidence and information, including witness statements, investigative reports, medical reports, photographs, video footage, audio recordings, meeting notes, correspondence and other materials. It is not really explained here on what grounds it is believed to be an airstrike. 86. The munitions employed were particularly appropriate for attacking unarmoured vehicles and individuals. Photographs provided by witnesses indicate that several S-5CB unguided air-to-surface anti personnel rockets produced in the Soviet Union, at least one RBK-500 series air-delivered cluster bomb carrying hundreds of sub-munitions, and at least two OFAB 250-270 unguided aerial bombs were used. The Syrian air force possesses all of these weapons in its arsenal. S-5CB rockets, loaded with flechettes, are intended for use against soft-skinned vehicles and personnel. Use of sub-munitions against a wide area target such as a convoy is also consistent with a planned attack targeting dispersed vehicles. Improvised air-delivered munitions and OFAB series munitions are suitable for targeting individuals, unarmoured vehicles and buildings. It appears that once aircraft had exhausted their weapon stores they continued to press the attack with guns, thus prolonging the attack and maximising civilian harm. 87. 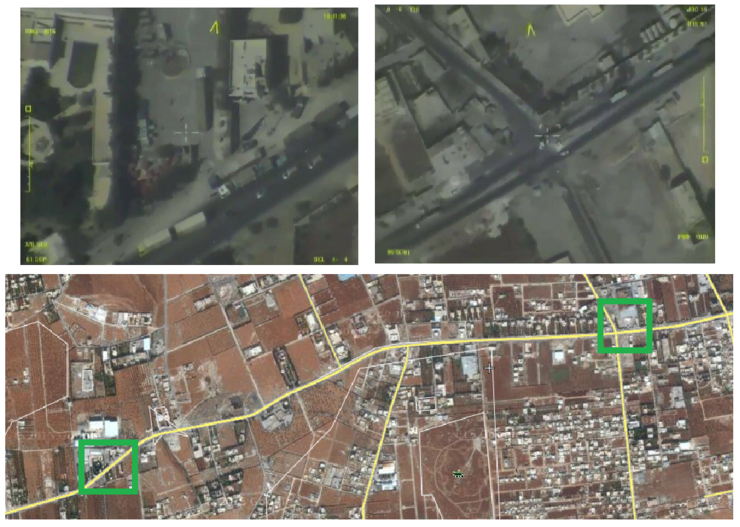 Early warning reports, satellite imagery, witness testimony, forensic evidence gathered at the site and data provided by Member States are consistent with the use of air delivered munitions and implicate Syrian forces in the attack. Syrian Su-24M strike aircraft and at least one and possibly two Syrian Mi-8 attack helicopters were operating in and around Orum al-Kubra at the time of the attack. No coalition aircraft employed weapons within 50 kilometres of the attack, and no Russian strike aircraft were nearby during the attack. 88. The types of munitions used, the breadth of the area targeted and the duration of the attack strongly suggest that the attack was meticulously planned and ruthlessly carried out by the Syrian air force to purposefully hinder the delivery of humanitarian aid and target aid workers, constituting the war crimes of deliberately attacking humanitarian relief personnel, denial of humanitarian aid and targeting civilians (see annex I, paras. 34-35). Refers to [ion.aspx UNOSAT satellite imagery analysis uploaded on the webpage of the Commission (unable to locate the imagery analysis doc). There are some small craters, but nothing that looks like a 250kg bomb dropped from the air, nor is there any suggestion in the text that these small craters are evidence that the convoy was struck from the air. Pmr9 (talk) 22:31, 11 March 2017 (UTC) . It is not explained on what grounds it is believed to be an airstrike. 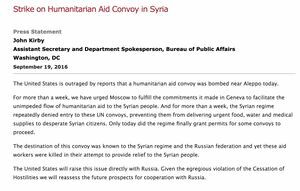 ... of the DPA summary (Department of Political Affairs) of United Nations Headquarters Board of Inquiry into the attack, which heralds in a by-line "UN-Syrian Arab Red Crescent aid convoy attacked from the air." They believe it was an air attack, apparently without any ground attack aspect. From the evidence we see, this could be true, or untrue. But motive does not point to Russia or Syria. The summary at least does not address the issue of motive, giving it a very poor basis for deciding between various competing claims and conflicting evidence. Russia has previously suggested a Predator drone run by the coalition was in the area at the time, unlike all of their own craft, and presumably involved. It's unclear if they retracted this, or what. The board knows Russia and Syria both deny involvement, which implicitly blames the coalition, just as the coalition earlier blamed Russia and/or Syria simply by insisting it was a clear air strike and it wasn't any of their own jets. Among the materials the board considered is mentioned "air tracks shared with it by the government of the Syrian Arab Republic." (point 7). There's no mention of air tracks provided by the coalition side. This is consistent with, but doesn't prove, coalition side guilt. They don't seem to show or describe or discuss this track any further. There's no mention of a recent piracy-related dispute with pro-government elements to suggest they're to blame. Weapons remnants not considered, due to chain of custody questions (may include unstated concerns they were simply planted). They heard very specific allegations that three Syrian helicopters, some unknown jets, and one Russian jet were all involved, and found this possible unlikely. 39. The Board stated that it had received reports that information existed to the effect that the SAAF was highly likely to have perpetrated the attack, and even that the attack was carried out by three Syrian Mi-17 model helicopters, followed by three unnamed fixed-wing aircraft, with a single Russian aircraft also suspected of being involved. They also see no proven connection between the JaM mortar truck and the convoy attack, as suggested by Russian military sources. The board "could not find any material link with the incident." Besides, they claim to believe it was exclusively an airstrike, which would rule out a mortar's involvement. But perhaps that call wasn't really as strong as it's made to sound by the DPA. This summary was later expanded into a long blog post. As of September 22, 2016 none of these scenarios has been ruled out. Russian and Syrian planes bombed the SARC compound. A U.S. or coalition drone bombed the compound. The compound was attacked with mortars or hell cannon by terrorists. The SARC team was taken hostage and murdered, while terrorist set off explosives around the trucks. So far nothing has been heard in public about the SARC team or the drivers. Did any of the survivors return to west Aleppo? Despite Kremlin denials, the open-source evidence implicating Putin’s warplanes is overwhelming. Other sources agree there was only one fatality among the Red Crescent workers, and it was their director, implying the rest survived. Some reports might give a larger number killed (8?). Who provided the medical care for the wounded is not clear, but they seem to have a poor survival rate. At this time, it's nor clear if there was even one survivor. This is implied, however, in the Guardian. The VDC lists only 11 victims - Mr. Barakat (SARC director) and 10 unidentified entries, listed as men from the town (given as Great Orme, or in Arabic غير معروف). This means they were given no real information. Russian drone footage (stills) show the trucks passing through Kafr Naha and at this facility further east, just east of Urm alKubra. Both spots are mapped below. If these images were taken at the same time, the convoy was divided. By shadows, when the drone passed (second photo anyway) the solar azimuth was about 207-211 degrees, equating to a time of about 1:30-1:40 pm. This must be Russia's source for the claim the convoy had arrived by 1:40. This is the same spot where at least some vehicles remained at the time of the attack, starting about 6 hours later. 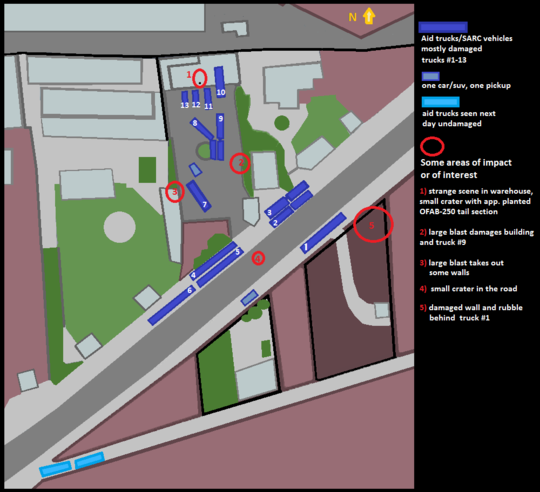 This graphic maps out roughly how many damaged vehicles there were the next day (13 trucks and/or trailers numbered) and where, and gives a start at mapping where apparent impacts happened (to be updated/improved). See talk page: scene analysis for more details. TASS report, at 20:42, says that at about 20:00 a web camera and transmission equipment at Assad Academy was hit. No video feed from any source is seen on Russian MoD site, checking on it at about 21:16. It is uncertain whether Russian MoD monitored in detail all of its own video feed; they would monitor areas of their own responsibility and attention, but not necessarily particular rebel sites, unless they had to, by prior agreements. There may be no arrangement for them to monitor security at the rebel warehouse, and they may not have prior experience that due to info warfare that might be quite a good idea. After watching their own video some more, Russian MoD found rebel large caliber mortar on a pickup truck moving with the convoy (report and video;video also here). 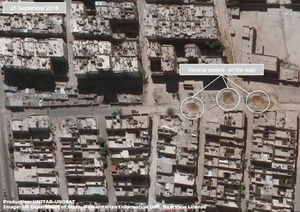 Urm al-Kubra was previously the site of the infamous fake Aleppo "Playground Napalm Massacre" in August, 2013. The area all around is reportedly under control of Harakat Noureddin al-Zenki, "moderate Islamists" who formerly received US military aid (they've since been cut-off). (Beeley) Al-Zenki was recently accused of launching a chemical weapons attack in Aleppo (August 2, ACLOS), and earlier had two top commanders openly partake in the abuse and beheading by knife of a captured boy (al-Zenki promised the killers were arrested, but they were seen out with guns two weeks later - again, see ACLOS). The attack came within minutes of the ending of a 7-day cease-fire negotiated between the US and Russia, just as a Russia-US campaign agains both ISIS and Jabhat al-Nusra was to begin, and two days after the embarrassing 'error' by coalition forces in Deir ez Zor that killed dozens of Syrian soldiers. See talk page for more on this context. Syrian Civil Defense workers released footage on June 27 purporting to show several volunteers extinguishing a fire at a warehouse in Urem al-Kubra, located 11 miles west of the city of Aleppo, which was allegedly caused by cluster munitions used in airstrikes over the area. SNHR: government warplanes (allies) missiles fired on Al Alamiyeh Press in Orm Al Kubra in Aleppo governorate, burning it and rendering it , June 11, 2016. It looks as if there is a fire in the warehouse right to the west of the SARC compound. In the September 20th photos the roof of the neighboring warehouse is seen to be bombed out. Mortar puzzle of Aleppo, video interview with Mikhail Hodarenok, Gazeta.ru war correspondent (text is different). Main point, excessive attention to this war episode ‎in the overall context of civil war. It is very regrettable that people died and valuables were lost, but overall, this is a small episode (and having to do with an attempt 'to score even' after the coalition error in Deir ez-Zor). Syria: White Helmets Staged ‘Russian Bombing’ Scene Near Aleppo, Lapped-up by Mainstream Media - 21st Centruy Wire, Contributors Patrick Henningsen and Vanessa Beeley. Cites independent analyst Petri Krohn. There are two possibilities: Thanks to all this surveillance might, the U.S. and its Allies know who exactly who destroyed that convoy—Syrian or Russian, or both— and from what base. But for reasons yet to be revealed, they haven't disclosed it to the world. This could be to protect secret electronic surveillance methods, or to preserve the administration's thus-far ineffective diplomatic efforts. The second possibility is also alarming: Because of gaps in the surveillance net over Syria, the military doesn't know. Invulnerable cardboard boxes and the missing 11 000 fragments : about the "Russian bomb" dropped on humanitarian convoy, Rusvesna, October 31, 2016. This page was last edited on 12 March 2017, at 01:54.